Quick! How many zeroes are in this number? Time's up! Did you get it right? Large literal numbers may be a cinch for the computer to read, but they aren't very friendly to human eyes. 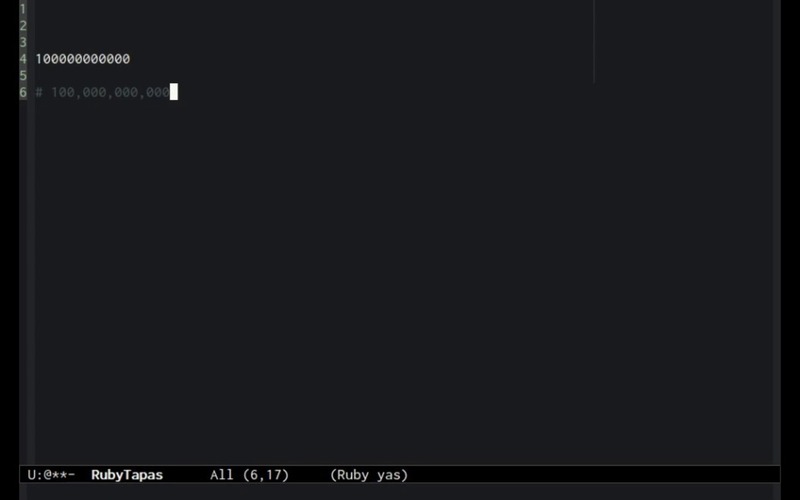 In this very short screencast, you'll learn how Ruby makes it easy to write pretty, readable numbers in your code. Continuing in this series about literals and quoting, let's talk about large integers. Quick question: how many zeroes are in this number? And I think you'll agree that's a lot easier to visually parse. That's all for today. Happy hacking! I wrote a method “thousands()” early in my Ruby learning, and it’s just a wrapper for a more general “groupsep()” method which can group arbitrary group-lengths with arbitrary separator characters, e.g. 18446744073709551616.groupsep( 3, ‘,’ ) # ==> “18,446,744,073,709,551,616” (and yes, both thousands and groupsep handle both String and Integer classes). I’m curous about eva; is there more info about it somewhere?